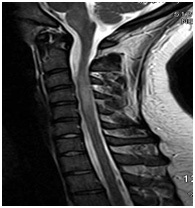 Neuromyelitis optica (NMO) is an uncommon disease syndrome of the central nervous system (CNS) that affects the optic nerves and spinal cord. Individuals with NMO develop optic neuritis, which causes pain in the eye and vision loss, and transverse myelitis, which causes weakness, numbness, and sometimes paralysis of the arms and legs, along with sensory disturbances and loss of bladder and bowel control. NMO leads to loss of myelin, which is a fatty substance that surrounds nerve fibers and helps nerve signals move from cell to cell. In the disease process of NMO, for reasons that aren’t yet clear, immune system cells and antibodies attack and destroy myelin cells in the optic nerves and the spinal cord. In most cases, however, the interval between optic neuritis and transverse myelitis is significantly longer, sometimes as long as several years. Most individuals with the syndrome experience clusters of attacks months or years apart, followed by partial recovery during periods of remission. This relapsing form of NMO primarily affects women. The female to male ratio is greater than 4:1. Another form of NMO, in which an individual only has a single, severe attack extending over a month or two, is most likely a distinct disease that affects men and women with equal frequency. The onset of NMO varies from childhood to adulthood, with two peaks, one in childhood and the other in adults in their 40s. The antibody, Anti-aquaporin-4 in blood seems to be present in about 70 percent of those with NMO and is not found in people with MS or other similar conditions. There is no cure for NMO and no FDA-approved therapies, but there are therapies to treat an attack while it is happening, to reduce symptoms, and to prevent relapses. Therapies used include methylprednisolone to stop the initial attack, immunosuppressent drugs such as mycophenolate mofetil and azathioprine and the monoclonal antibody ritixumab . If frequent relapses occur, some individuals may need to continue a low dose of steroids for longer periods. Plasma exchange (plasmapheresis) is used with people who are unresponsive to corticosteroid therapy. Pain, stiffness, muscle spasms, and bladder and bowel control problems can be managed with the appropriate medications and therapies. Individuals with major disability will require the combined efforts of occupational therapists, physiotherapists, and social services professionals to address their complex rehabilitation needs. Most individuals with NMO have an unpredictable, relapsing course of disease with attacks occurring months or years apart. Disability is cumulative, the result of each attack damaging new areas of myelin. Some individuals are severely affected by NMO and can lose vision in both eyes and the use of their arms and legs. Most individuals experience a moderate degree of permanent limb weakness from myelitis. Muscle weakness can cause breathing difficulties and may require the use of artificial ventilation. The death of an individual with NMO is most often caused by respiratory complications from myelitis attacks.